Can you believe it? This is a person who has seen the dead or ought to go to Iraq and visit the morgue to see the dead. Crean has told Labor MPs he expects them to treat [war criminal] George W Bush with respect and dignity. Hey rocky let me pull respect and dignity out of my pocket! Correct me if I'm wrong but I think you have to earn respect and dignity. Some Labor MPs are strongly opposed to [war criminal] President Bush's address to a joint sitting of Parliament and that's why federal Labor can't win an election. No solidarity! One MP plans to wear a white arm band to indicate his opposition to the Iraq war. In a caucus meeting today, Crean told MPs courtesy should always be extended to invited guests. He said members should listen respectfully and at the end of the speech make an appropriate acknowledgment. But war criminals shouldn't be invited to this country, isn't there a law that prevents war criminals visiting Australia. Does that mean if they're war criminals with plenty of money its okay? Or is it because John Howard is also war criminal and George Bush's co-offender so it's okay? MPs were told a precedent was set when Bill Clinton was given a standing ovation after he addressed the Parliament in 1996. One backbencher responded saying a standing ovation for President Bush would be "over the top". No! Under the table. Crean's office says the Opposition leader thinks they should applaud at the end of the speech and then stand as the [war criminal] President leaves the chamber. A good reason why Simon Crean should never be elected as Prime Minister. The Greens say Australians will be excluded from the public gallery when President Bush and the Chinese leader give their addresses. Senator Bob Brown says MPs can invite guests and there are now no seats left for the general public. "The gallery belongs to the public, the public should be allowed in there," he said. "The simple way here would be a ballot of applicants and the public could ballot for an opportunity, on these special occasions as the Prime Minister puts it, to hear heads of visiting foreign powers." A Federal Labor frontbencher says any protest by Opposition MPs, when the United States President addresses the Parliament next week, would be inappropriate theatrics. Lindsay Tanner says while he is also a strong critic of the US President, he accepts the view of Mr Crean that any visiting head of state should be treated with respect. "As far as I'm concerned, if it is appropriate for the entry and exit of the President to be acknowledged by members standing I don't have problem with doing that, I doubt if I'll be the most enthusiastic applauder in the chamber at the time but as far as I'm concerned to focus on these minor theatrics is completely beside the point," he said. THE MONGREL: Perhaps a funeral march would be appropriate theatrics, listing the dead in Afghanistan and Iraq. Respect is something given when something is due. Does that mean Simon Crean is harbouring war criminal? Isn't that an offence? As far as we're concerned it is inappropriate and illegal for the entry and exit of a war criminal, whether that person is a President of the US or Guantanamo Bay. We have a problem with members standing. We have a problem with that, I doubt if we'll be the most enthusiastic knockers outside the chamber at the time but as far as we're concerned, to focus on these issues is exactly the point. I think people call it leading by example. In this case Lib/Lab are the blind leading the blind. 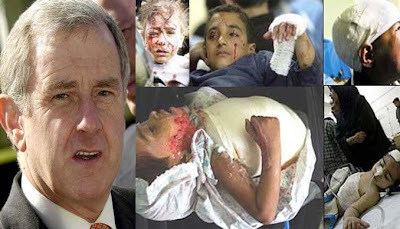 Illegal and degrading war crimes: Society on the New World Order (OWN)! While Australia and the US are very distinctive societies war criminal, Prime Minister John Howard and war criminal, President George Bush share core values.